When it was first built, Philadelphia’s City Hall was going to be the tallest building in the world. While it was quickly surpassed in height, City Hall shines on in the heart of Philadelphia. But overshadowed by the grandeur of the rest of the historic building, the City Hall courtyard has long been under-used as a public space; a utilitarian backyard once used for deliveries and transit, but not one where Philadelphians went to play or relax together. 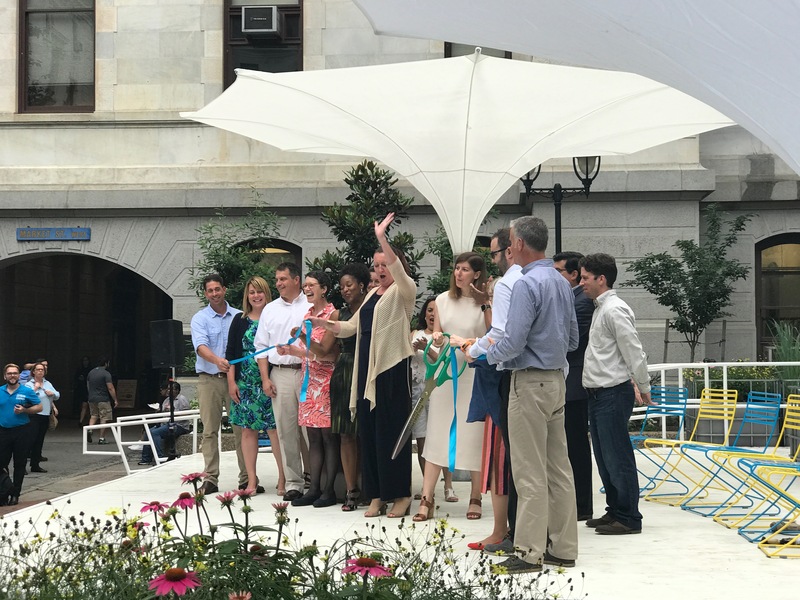 So, last year when the Mayor’s Fund for Philadelphia was awarded a Southwest Airlines Heart of the Community Grant, the next step was to transform the courtyard into the “living room” of City Hall. Philadelphians were done with planning as usual. But, PPS and its local partners, including the Planning Commission, the Philadelphia Water Department, the Commissioner for Public Works, the Department of Public Property, the Mayor’s Fund for Philadelphia, and the Office of Arts, Culture, and the Creative Economy needed to work with residents, office workers, and visitors alike. So, in a city with a long history of community participation, involvement had to go beyond the planning workshop. Instead of organizing another formal meeting, PPS and its local partners went to where the people were: at a traveling beer garden. 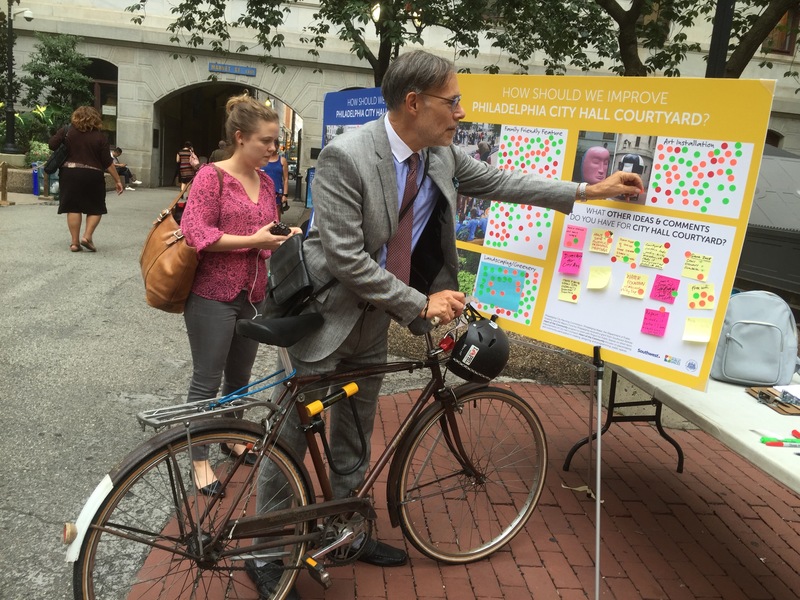 PPS went to Philadelphia Parks Department’s popular Parks on Tap event, deploying feedback posters to get a feel for what frequent visitors needed in the courtyard. Newly energized locals talked over beers and made it clear that they wanted the courtyard to match their own enthusiasm; a revival of a space that had for so long laid dormant. 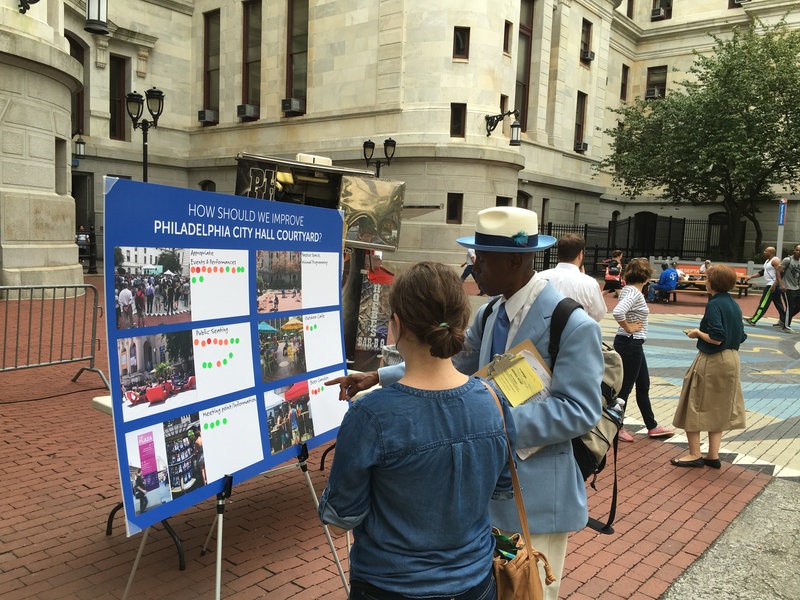 Philadelphians at a Parks on Tap event, giving feedback on the courtyard space. 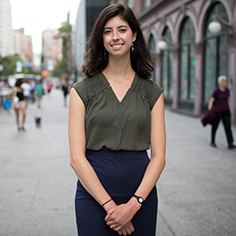 ‍Locals were eager to weigh in on the long under-used space. Locals wanted a place to dig into the up-and-coming arts scene in Philadelphia. A modular stage would give the courtyard the flexibility to transform into a small-scale concert hall, or remain an open space. So, PPS and its local partners made a call for Philadelphia’s designers and artists to submit ideas for, and produce the stage. Local radio stations picked up on this call, broadcasting the idea to all Philadelphians -- soon, a selection committee comprised of locals and the City Hall’s Facilities Department had 23 proposals from which to choose. Eventually, the chosen groups built the stage: Exit, Sikora Wells Appel, and Reilly Remodeling created a performance space just as unique as the courtyard. Beyond providing a space for the arts, the courtyard adopted innovative sustainability features: Umbrellas were designed to double as rainwater collection containers, watering the surrounding gardens. These temporary additions were enough to set the courtyard on track to becoming a beloved public space. Rain-collecting umbrellas and moveable chairs made the courtyard a comfortable gathering space. ‍Launching the new space, with project partners showing off the new modular stage. The courtyard didn’t stay quiet for long. Daytime activities in the space are a hit with locals, who see the once-sleepy space as somewhere to connect with friends or unwind. Philadelphia’s Culture on Tap program brought performances to the courtyard; jazz ensembles and local choirs continue to draw crowds to a space that was once a through-way, rather than a destination. 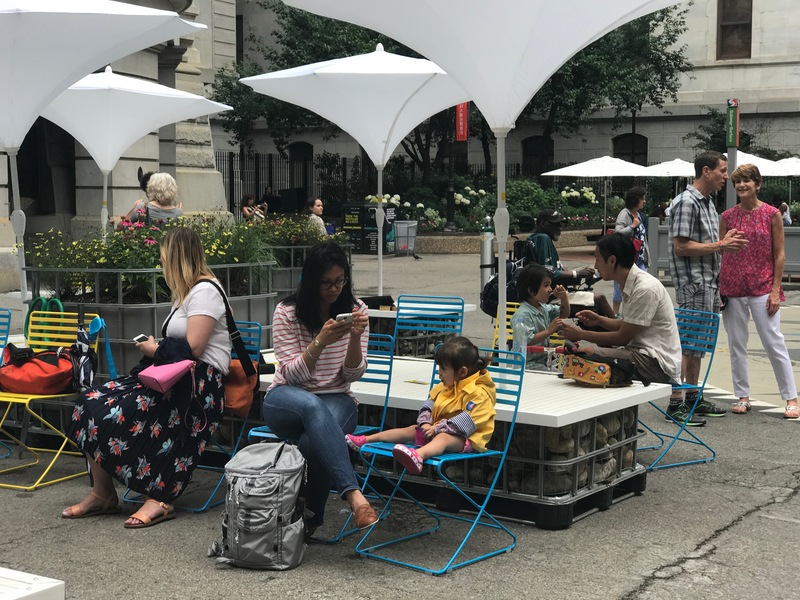 Keeping pace with the trend toward renewal across Philadelphia’s public spaces will take some planning; the pattern has swept through places like the privately managed Dilworth Park, which stretches out in front of the City Hall building. Now that the courtyard has become a valued performance space, Philadelphia is thinking long-term: A larger-scale re-design will likely be linked to changes in the local transit system, SEPTA. The courtyard will continue along the path of revival, as Philadelphia continues to redefine itself through its public spaces. Sometimes the first step toward a better space is actually a stage: Elevating the arts in an under-used Philadelphia courtyard has proved to be an effective tool for community engagement. As Philadelphia looks toward the future of its newest placemaking success story, one thing is clear: This is not your average city hall.